I share my home with three herding dogs—two Australian Shepherds and one English Shepherd. As a result, I have come to the conclusion that these dogs are born with springs in their legs. Jumping comes naturally to them and amazingly enough, they start bouncing at avery young age. Unfortunately, a dog who jumps on people can scratch skin, ruin clothes, and even knock people down. Plus, it’s annoying. Thankfully, it’s not difficult to teach, “Sit” and “Don’t jump.” I begin teaching this as soon as the puppy joins my family but even adult dogs can learn this lesson. Choose your words and stick with them. If you use the word, ‘Down’ to tell your dog to get down off the furniture, don’t use that same word to mean don’t jump on people. Each word or phrase needs a unique meaning. We’ll use, ‘Don’t jump’ as an example. There are many different ways to teach your dog this lesson and for this exercise it doesn’t matter which technique you use. Just make sure good things happen when he sits. Praise him, pet him, and tell him what an awesome dog he is. All good things happen when sitting. Ask your dog to sit before petting him, before he gets a treat, before you hook the leash up for a walk, and before you throw his ball. You want him to think everything good in his life happens when he sits. While you’re in the process of teaching your dog to sit, be proactive and prevent him from jumping. That means in situations when you know that he’ll jump on you, ask him to sit first, and then praise him when he does. If he’s excited, you can hold his collar with one hand to help keep him in the sitting position while you pet him with the other hand. If you know people will be coming to your house and your dog will be excited and want to jump on them, put a leash on your dog and keep him close to you. 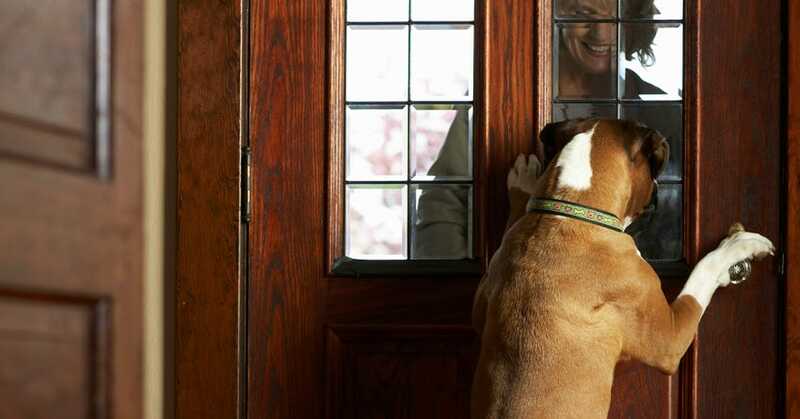 Then when your family members or guests arrive, restrain your dog and have him sit before they pet him. As you begin teaching your dog to sit for everything he wants, including to sit for petting, greet him with empty hands. Then if he forgets to sit, you can take hold of his collar, tell him, “Don’t jump!” and help him sit. Dogs repeat actions that are rewarding to them and jumping on people gains an instant reaction. Teaching your dog to sit has to become just as rewarding so praise and pet your dog every time he sits. Be consistent with the rewards. Then, be patient while you change the bad habit.